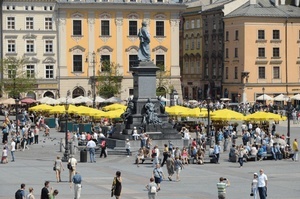 This tour is inspired by many tourists who liked our ‘Grand Tour of Poland’, and wished it had lasted even longer. This is one of a kind program for those lucky to have more than two weeks to explore the outstanding heritage, charm and lifestyle of Poland. The Polish Dream comes with more quality time in Gdańsk and Zakopane; it unlocks the marvellous landscape of the Masurian Lakes and explores the dark and grim atmosphere of Hitler’s Wolf’s Lair. Make a voyage on the most beautiful Polish river and become convinced that in Poland everything is possible, even great wine. This morning, our sightseeing tour will cover the very best of Warsaw. The reconstruction of Old Town after the war has put this colorful and charming part of the city on UNESCO's World Heritage List. We will tour the old Jewish Ghetto area where we can still see parts of the wall that separated the Jews and the Poles during the occupation. We will travel the Royal Route that links the Royal Castle to Wilanow Palace, including a visit to Warsaw's most beautiful park, the Royal Lazienki Palace Park. You will have some free time for lunch on your own before visiting the very modern Warsaw Uprising Museum, commemorating the uprising of 1944, the most important event defining today's Warsaw. You can also omit this visit and have some free time if you wish. Gdansk is a historic and cultural centre with outstanding examples of Gothic, Renaissance and Baroque architecture. During sightseeing you will see the Old Town, St. Mary’s cathedral (the largest Gothic church in Poland) dominating the town, the Neptune Fountain and the Artus Court. After we drive to Oliwa, one of Gdansk’s most attractive districts, with a large Cistercian monastery complex including the Oliwa Cathedral. The cathedral is home to a rare 18th-century pipe organ, one of the largest of its kind in the world. After an organ concert your will have free time for lunch. We depart for Wroclaw, with a stop in Gniezno, the first capital of Poland, on the way. Gniezno is important to understand the beginnings of Polish Statehood. Inside the 14th-century Gothic cathedral, we find the tomb of Poland's first patron saint as well as a beautiful Romanesque bronze door. Arrival at the medieval town of Poznan, the capital of Greater Poland for a short city walk with a guide. Don’t forget to taste local delicacy, St Martin Croissant! Afterwards transfer to Wroclaw. Dinner in a superb local restaurant. Overnight stay. This morning you have some choices: you can enjoy some free time to see Wroclaw's old town on your own or see the impressive university hall or you can join a complimentary sightseeing trip to Swidnica, about an hour's drive away. Here you will find the large wooden Church of Peace, dating to 1657 and now on UNESCO's World Heritage list, built without using a single nail, it is one of the few places where Protestantism was permitted after the Thirty Years' War. After breakfast, we go underground to a museum located beneath Krakow's main square, to explore the medieval history of the city. Next, we will hear the famous bugle call before entering St. Mary's church where we can see the largest Gothic altar in Europe. This morning we see the last highlight of our tour- Czestochowa. It is the most important Catholic shrine in Poland honoring the Virgin Mary, visited by pilgrims from all over the world. This monastery is an impressive display of Polish patriotism and piety. A resident Pauline monk will show us the famous Black Madonna as well as the monastery premises.